Discus Ich is a parasitic infection of fresh water fish caused by ciliate. It can be ichthyology which is a branch of zoology devoted to the study of fish. “Ich” is the small, white and clear spots on the bodies of discus and several on the fins. The spots are a bit smaller than the typical salt granule-like spots. Temp changes are one of the most frequent cases of ich outbreaks. Parasites which cause this disease include oodinium, costia and ich. This is another of the most deadly discus fish diseases is white spot disease. This disease is caused by the protozoan and it open body ulcers on side of the fish. The disease is highly contagious and spreads rapidly from one fish to another. It can be severe when fish are crowded. 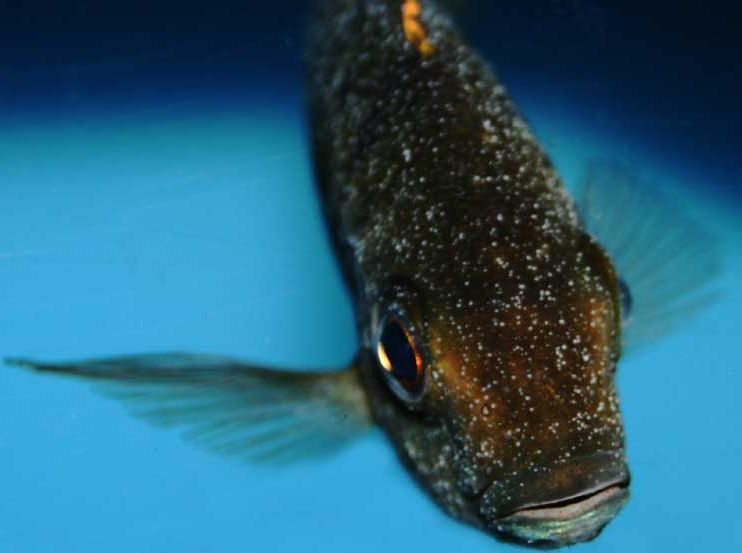 This disease is major problem to aquarists and commercial fish producers worldwide. This organism is an obligate parasite which means that it cannot survive unless live fish are present and even capable of causing massive mortality within a short time. An outbreak of ich is an emergency situation which requires immediate treatment. If untreated, this disease may result in one hundred percent mortality. The main sign of discus ich infection is presence of small white spots on the skin or gills. These lesions look like small blisters on the skin or fins of the fish. It looks as if the fish has salt on it. Prior to the appearance fish may show signs of irritation, flashing, weakness, loss of appetite and decreased activity. If the parasites are only present on the gills white spots will not be seen hence fish will die in large numbers. In these fish, gills will be pale and very swollen. White spots should not be used as the only means of diagnosis because other diseases may have similar appearance. Gill and scrapings should be taken when the first signs of illness are observed. If the “Ich” organism is seen, fish should be medicated immediately because fish which are severely infected may not survive. “Ich” is common problem in aquariums and different aquarists adhere to different regimes when it comes to curing “Ich”. One mode of treatment can be the control of “Ich” outbreaks which is usually very difficult due to the parasites’ unusual life cycle as well as the effect of water temperature on its life cycle. Of the life stages in the life cycle of L. multifiliis, only the free-swimming tomites are susceptible to chemical treatment. The application of a single treatment will therefore only kill tomites which have emerged from cysts and have not yet burrowed into the skin of host fish. The treatment will hence not affect organisms which emerge after the chemical has broken down or been flushed from the system. On the contrary, repeated treatments will continually kill the juvenile tomites, leading to discontinuation of the infection. The epizootic will be controlled as more adult parasites drop off the sick fish, encyst, and produce young which cannot survive because of the repeated application of chemicals. This process will be greatly accelerated if organic debris can be removed from the tank or vat following treatment. This will remove many cysts from the environment, decreasing the number of emergent tomites. Water temperature has a tremendous influence on how fast the life cycle for discus Ich is completed. At warm temperatures (75-79°F), the life cycle is completed in about 48 hours, which means that chemical treatments should be applied every other day. At cooler temperatures the life cycle is prolonged and treatments should be spaced further apart. Treatments should never be discontinued until all mortality from “Ich” has stopped. Fish should be closely watched during recovery; the weakened fish may be susceptible to a secondary bacterial infection. The choice of chemical used to treat “Ich” will be based upon water quality conditions, species of fish to be treated, and the type of system fish are housed in. In general, copper sulfate, formalin and potassium permanganate have all proved to be effective against “Ich” when applied at the correct concentration in a repetitive manner as described above. Make sure that you quarantine the ich infested fish immediately upon first signs to prevent it from spreading to other fish. Also ensure that you raise the water temperature to 90 degrees in your quarantine tank to help kill the infection. Perform daily water changes of 50% in the quarantine tank as well.